I have shared with you a lot of great and useful information in the past and all of that is archived at www.electricitybook.com/news. And you may need a lot of that sustainable living information in the near future. I am not one of those doomsdayers or even a prepper (someone who builds bunkers and stores years worth of food and ammo in preparation for a world catastrophic event). I am more of a realist who can see things coming which may very well change your life as you know it. National Debt - There are a few "bubbles" that have yet to burst and included in them is the dollar bubble and the US national debt bubble. There's an election coming up and the last thing Obama wants is for a financial catastrophe to happen just before the election. If that happens, his chances of reelection are somewhere between slim and none. So he and his administration are keeping things afloat as long as possible. I got news for you... the whole financial system has already collapsed. That's right... even further than most people know about. The US government and The Fed and some of the major banks work together to artificially and quickly stop the stock markets from crashing these days. A prime example is the May 2010 flash crash. Don't know about you, but that fact alone scares the hell out of me! 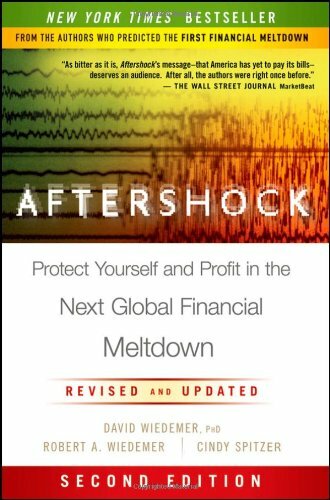 For your protection and your family's I highly recommend you buy the book Aftershock - Protect Yourself and Profit in the Next Global Financial Meltdown by David Wiedemer, Phd. After reading the book, at least you'll be more informed than most people about what is going to happen in the very near future. If you really think the US Government has the capability to repay a $15 Trillion national debt, well... you deserve what you are going to get. That's all I have to say about that. 2008 thru mid 2012 is going to look like the Good Old Days when the next bubbles finally burst! Inflation - Back in early 2009, QE1 injected close to $2 Trillion buckaroos into the US economy. Man... they must have been running those "printing presses" day and night! In late 2010, QE2 injected another $600 Billion into the economy. I hate to tell you... massive inflation is on the way! You simply can't print that kind of money without inflation to go along with it. Your dollars are going to become less and less valuable. Read more about all this in the book Aftershock. Peak Oil - It's alive and well folks! Sure... we have found new sources of oil in the US and Canada, but it's not the free flowing kind of crude. It's much more expensive to get out of the ground. And demand certainly has not gone down. We are currently seeing the switch to natural gas finally come about with new sources in the US, but it has yet to be seen how fast the transition will be... trucks, cars, and filling stations need to be built. CNG car conversion kits need to be cheaper and more accessible. There is an ample supply of natural gas which will alleviate some of the demand for oil. I even think it may be a renewable form of energy. Bottom line - as I have been telling you for years, don't expect the price of gasoline to go down any time soon! Ethanol & Biodiesel - People are figuring out real quick that it was never feasible to make ethanol the way they do in the US. See the chart above. With the loss of government subsidies, many are going under. Same with biodiesel - loss of subsidies, a EU tariff, and some bad press about some countries cutting down rainforests to grow oil producing plants & trees has pretty much shut down the biodiesel industry. 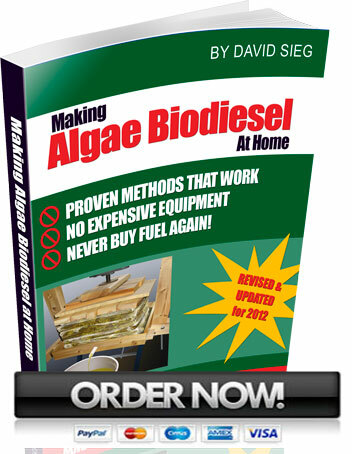 Algae for biodiesel still looks like a viable alternative. Solar - Last time I checked solar panel prices just a few years ago, they were around $3.50 a watt. Now you can get them for $1.40 a watt for Chinese panels on up to $2.39 a watt for Made in USA panels. That's a whole lot cheaper than in past years. You know... I've never been a big solar panel fan because of the huge price and little amount of power you get for your money, but that is changing as we speak. Couple the low prices with some of the State and Federal Incentives and it makes more and more sense to install solar panels. 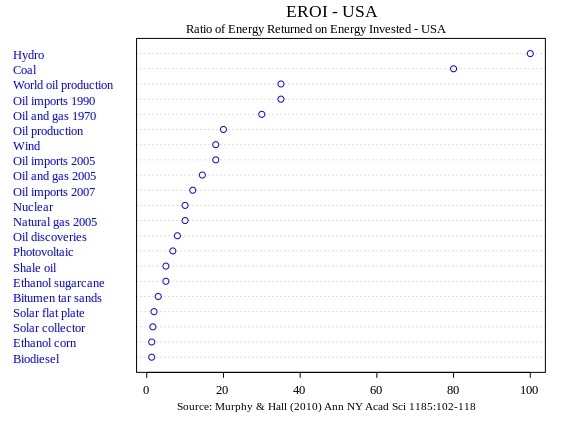 Remember... the incentives can all be found here: www.dsireusa.org - just one of the many little nuggets of great info found in the book Electricity - Make it, Don't Buy it. Extreme Solar Flares - Just last week, we had some serious solar flares that may have disrupted satellite communications, power grids, and a few other minor problems. It wasn't the "big one", but it just goes to show you how these emergency situations can pop up in a moment's notice. Sustainable Living - In the troubled times ahead, I think it is more important than ever to get as self-sufficient as possible. Go back and read my old Alternative Energy/Sustainable Living articles and see what you can use in your own home. At the very least, have a reliable source of fresh water and maybe a month's supply of food on hand. Can you live without electricity? You never know when a natural disaster will hit. And, after reading this newsletter, you should know what is coming in the future. When the government goes broke and the free handouts come to a screeching halt, and people get hungry, what do you think is gonna happen?